Choking occurs when a person can no longer cough, speak or breath. This life-threatening breathing emergency requires immediate care. 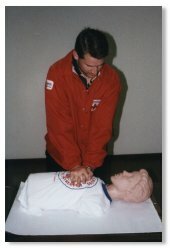 CPR is short for "cardio-pulmonary resuscitation." 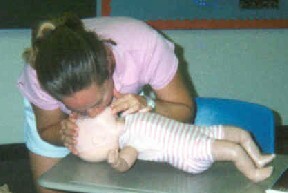 This is the skill used to help anyone who is not breathing and shows no signs of life. AED stands for automated external defibrillator. This is the device that gives an electrical shock to help restart the heart of the victim of cardiac arrest. First Aid teaches emergency care for severe bleeding, broken bones, injuries to muscles and soft tissue, burns, poisoning/allergic reactions, animal bites and stings, sudden illness and extreme heat or cold. The Certification Course covers Adult/Child/Infant CPR/AED and First Aid Basics. It includes all course materials and supplies. Each session also covers how to recognize an emergency, what to do to protect yourself and others, and how to activate and use an "Emergency Action Plan." Participants who complete the on line course work and are able to independently demonstrate the skills receive certification valid for 2 years. This non-certification course covers all the essential information and skills but no testing! The Audit Course can be run in one session of 4 hours or 2 sessions of 2 hours each. This course covers the same information as the certification course but there are no skill requirements and no written exams. Participation certificates are given to all who attend.